After driving over the Carolina Bridge at the breaking of dawn this morning, I glanced to the west having noticed movement. In the darkened gray of the early morning I could see silhouettes of at least eight deer likely munching on early Spring grass sprouts. They really are all the more creepy when seeing them as ghostly shadows. Since I’m personally very angry at those naughty creatures for nearly destroying an Arborvitae hedge over the winter, I’ve been keen to take notice of the damage they’ve done around our City. Seems everywhere I look where there’s evergreens and especially Arborvitaes, they’ve done just as much or more damage. One particular property which I used to consider having the most manicured hedge, I noticed not but a week ago how it’s been nearly stripped bare as high as the deer can reach. I’ll bet because they’ve got such long narrow faces and big teeth, they could eat corn through a picket fence. As I’ve said numerous times, “Mason City’s problem with the deer is only going to get worse before it gets better unless there is a hard and fast plan in place that will work to keep their population under control. This weekend has been somewhat successful for my office with one property under contract and another offer on one of my listing that will likely be accepted once some of the language in the contract has been cleaned up. Even though it was such a dark gray day with that annoying spitting of light rain, my public open house at 216 Meadow Lane was far more a success than I’d expected. There were people attendance for the entire two hour span. Nearly everyone was captivated by the views of Cheslea Lagoon along with how extra large the room sizes were in comparison to what they’ve been looking at around the City. There were two very small ducks that were likely not even half the size of Mallards swimming back and forth and doing random diving’s for whatever they must have been chasing under water. I noticed one of them coming up with something in its mouth but it went down its pie hole before I got a good look at it. One of the attendants thought they were baby Mallards but I couldn’t help but say, “I’m sure not. Wild ducks wouldn’t have had half grown ducklings this early in the year.” I’ll have to look a see what very small duck would be either nesting here or just traveling through on their way north. I heard once there are small ducks that travel through North Iowa on their way to Canada and now wondering if they could be Teals. With that said, after my wonderful experience with Cheslea Lagoon’s wildlife, I’ll say there’s no better property on the market here in Mason City that would compare with 216 Meadow Lane. I hope whomever the new owners are, will appreciate the grandness of the natural beauty that’s just outside their bedroom, kitchen, dining, and family room windows. I had to take a small break from my real estate job and find a door to replace one that was somehow broken and removed by a tenant and replaced by an inferior plastique one. I went rummaging and found one the right size and opening on the correct side. It was really filthy so did some deep cleaning so to ready it for painting. I’m not sure where it came from but I know it’s been in storage for quite some time. I took a picture of the decal on the door’s glass. So funny! 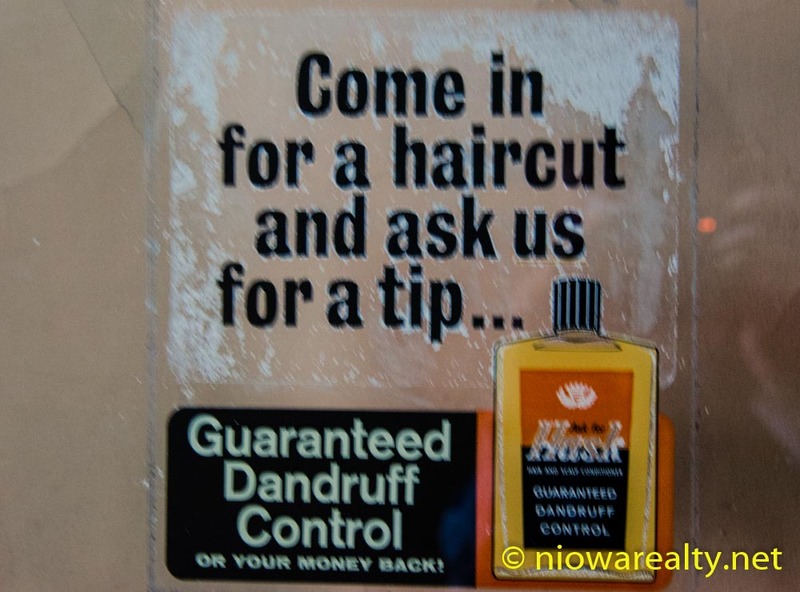 Even back then they guaranteed dandruff relief.